Not a definitive cinematic statement on the Rwandan genocide but certainly a far preferable dramatic treatment of the atrocity than Hotel Rwanda, Beyond the Gates tackles its true story (filmed where it actually took place) with the type of blunt realism absent from Terry George’s celebrated 2004 Don Cheadle vehicle. 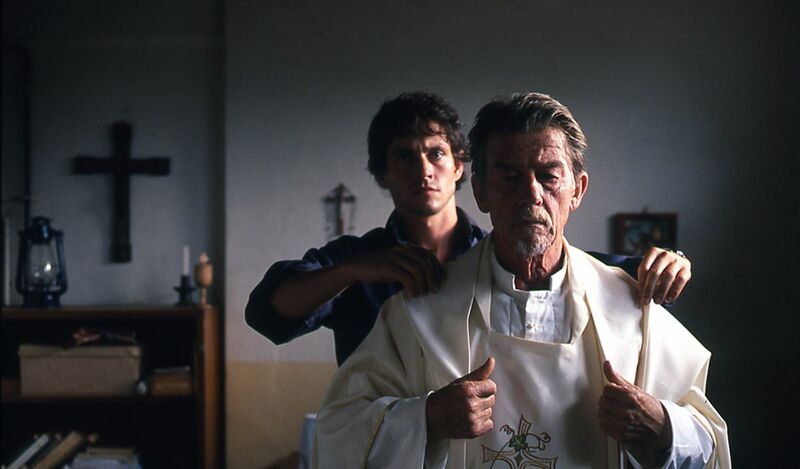 Director Michael Caton-Jones shoots with a rough-around-the-edges griminess that brings urgency to his tale regarding the Ecole Technique Officielle, a Kigali school run by devout priest Christopher (John Hurt) and staffed by do-gooder teacher Joe (Hugh Dancy) that, once the country’s president is assassinated, becomes not only a base camp for Belgian U.N. forces, but also a refuge for the minority Tutsis from the majority Hutus engaged in systematic, machete-aided ethnic cleansing. As with too many recent Western-produced films about the continent, Beyond the Gates boasts gallant whites as its protagonists, a familiar decision that once again results in only an outsider’s perspective on the crisis, the viewpoints of Rwandans themselves limited to the condemning stare of a young runner named Marie (Children of Men‘s Claire-Hope Ashitey) at the fleeing Europeans she believed to be her friends. Nonetheless, a refusal to actively engage the African experience doesn’t disastrously hamper its depiction of the chaotic situation, with Joe’s trips into the neighboring town marked by scenes of shocking, gruesome murder. Forming a protective barrier between the Hutus and Tutsis, the school’s gates are subtly linked by Caton-Jones to the U.N. “mandate” to monitor (and not enforce) peace, which soon becomes the West’s own self-constructed impediment to involvement. Christopher and Joe’s noble efforts counterbalance such inaction, though their labor, as befitting a story marked by the loss of idealism, mainly results in a wavering of faith in God, humanity, and themselves. This final doubt is hauntingly evoked during a conversation between Joe and BBC news reporter Rachel (Nicola Walker) in which Joe admits that his desire to “make a difference” is really just a selfish, arrogant attempt to star in his own Oxfam ad, and Rachel, articulating the racism that played a part in the West’s lethargic response, cops to being more affected by the Bosnian than Rwandan catastrophe because in the former, she saw her mother in the murdered, whereas here, she sees only “dead Africans.” It’s a moment of blunt-force confrontation, and one that almost fully absolves Caton-Jones for having subsequently made Basic Instinct 2.